The Hockaday Museum of Art invites visitors age 60+ to enjoy free admission to the Museum for Senior Tour & Tea Day. A docent-guided Gallery Tour will begin at 10:30am; new and returning visitors will learn about the permanent and current exhibitions. The Hockaday Museum of Art is located in the cultural district of downtown Kalispell at 302 Second Ave East. It is housed in a 1904 Carnegie Library building that appears on the National Register of Historic Places. The Museum is a registered 501(c)3 nonprofit organization, open year-round, Tues-Sat from 10am-5pm. A wheelchair accessible entry and elevator are provided. 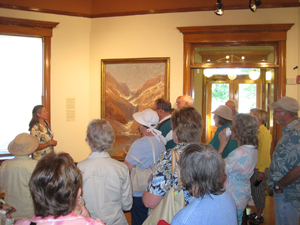 For more information, please visit www.HockadayMuseum.org or call 406-755-5268.